The group meets in January, March, May, July, September and November on the 3rd Thursday of the month. Check our Wellbeing Events to confirm dates etc. “If you’re living with tinnitus, reaching out and talking about how you’re feeling is vital, and support groups play a crucial role in allowing those with tinnitus to do just that. When I first joined the British Tinnitus Association several years ago the nearest support group was Redbridge and due to restricted car-parking it was for local residents only. I am delighted that the Southend Tinnitus Group opened in May 2017. There is no cure at the moment for tinnitus suffers although some research is taking place and it is important that people who have this condition know that they are not alone and come along to our meetings. Although I felt that a support group was needed in this area, I did not have the time to start one myself due to work commitments. The BTA produces a quarterly magazine and I would always scan the puiblication hoping to find that a support group had started close to Southend, but to no avail. So when I retired I decided that the only way was to start a group myself! The BTA was very supportive in starting the group and after finding a suitable venue with good transport links and a reasonable hire price the Southend Tinnitus Support Group was formed. The BTA sent out a press release and on the 22nd May 2017 the first meeting was held at the Southend Adult Community College. The first event was very successful with over 20 people attending. We had a speaker from the BTA to inform us about latest developments, which everyone found very interesting. 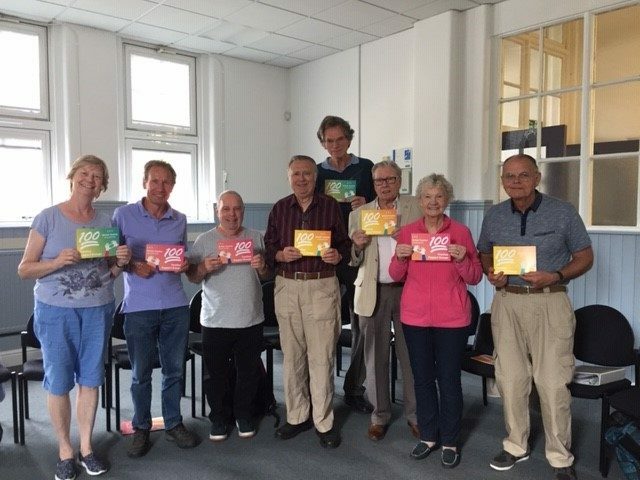 Southend Tinnitus Support Group in June 2019, celebrating the milestone of 100 tinnitus groups across the country. Tony is at the back of the group. The group has to be self-funded and we ask members for a small admission charge to cover room hire, refreshments and general running costs. We have different speakers at many of the events and, of course, relationships are built between the members and we gain inspiration and support from each other. This, in turn, helps us all feel more in control and more confident. If you are have tinnitus and live in Southend or surrounding areas, you would be most welcome to attend. And please, do help spread the word. For more information about the Southend Tinnitus Support Group, Tony can be contacted by email: southendtinnitus@gmail.com. You do not need to be a member of the BTA to attend. The BTA is a registered independent charity and is the primary source of information and support for people with tinnitus. The charity carries out research that will help people to manage their symptons and, they hope, ultimately to find a cure. The BTA helpline for sufferers is: 0800 018 0527, available Monday to Friday, 9am to 5pm.